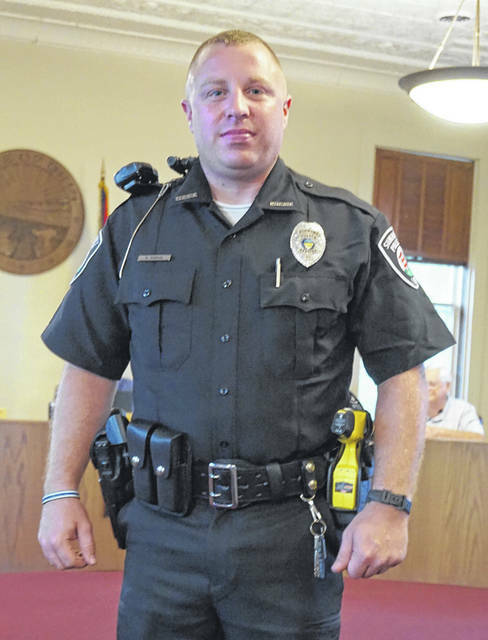 Officer Matthew Bowman models the Sunbury Police Department’s new uniform during Wednesday’s Village Council meeting. The Sunbury Police Department unveiled its new uniform during Wednesday’s Village Council meeting. Officer Matthew Bowman modeled the uniform before leaving to respond to a call. Police Chief Robert Howard described the uniforms as being “more professional” and “less tactical-looking” than what the officers previously wore. Among the changes is that the bulletproof vest can now be worn underneath the shirt. Howard added the police will soon be receiving AR-15s. Officers have been trained, not only in how to operate and maintain the rifles, but in situations where they may be used, said Mayor Tommy Hatfield. Council approved spending $4,000 from the general fund on the village’s Fourth of July fireworks display. “We’re taking it more under our wing,” said Theresa Dronsfield of the Big Walnut Civic Association. She said the association has raised $3,500 for the fireworks to date, which includes admission from the flea markets held on the square. Cindy Erndt from the Big Walnut Civic Association also received council’s approval for street closures and potentially extending hours in the event of bad weather for the Sunbury Sizzle festival on the square on Aug. 18. She said there were no football games the night before, making the setup easier. Howard said there were no problems with last year’s event. The next council meeting, which was scheduled to fall on July 4, has been canceled due to the holiday. That means council will next meet on July 18. However, an open house for a potential Charter Commission was proposed by councilman Joe St. John for 6:30 p.m. on July 16 in the town hall. Council is seeking 15 resident volunteers to serve on the commission, which, if approved by voters, would be responsible for determining how Sunbury would be governed once it attains city status following the 2020 Census. The village will also put together a fact sheet about the commission. A couple ordinances received first readings. One was amending the cruelty to companion animals section to include tethering restrictions. “We fine-tuned the City of Delaware’s ordinance,” said councilman Dave Martin. Also heard were ordinances for establishing a NorthGate Centre Community Entertainment District; and for voters to decide whether beer and liquor could be sold in the district. Two recent deaths were also noted. It was said that the family of former Police Chief Gary Hall was interested in establishing a fund for the police department. Councilman Martin Fisher said the hiring of a new BST&G Fire Chief was on hold until July following the passing of Jeff Wilson. Fisher said there were 38 applicants, and the field has been narrowed to seven.